How many times have I been told that without separatism, Montréal would still be Canada’s first economical power? According to american Marc L. Levine, in the 10 years following the 1976 PQ election, 99,000 anglophones left Montréal. (The Reconquest of Montreal, p. 120) This is a huge number, and, as most english commenters will not miss noting, those out-migrants were disproportionately young and well educated, Montréal was thus denuded of its best and brightest. Let’s assume that all of them went to Toronto and that no one went elsewhere in Canada or in the US. Let’s also assume that all of them had two children as soon as they got to Toronto. The 99,00o figures now becomes 297,000 new inhabitants for Toronto. And these new inhabitants helped grow Toronto’s economy thus bringing more people not only from Montréal but from abroad. Let’s say that a new job was created by the presence of each one of these new inhabitants and that these jobs were filled exclusively by other new comers. The 297,000 figure doubles and is now a 594,000 inhabitants gain for Toronto and its surroundings and, let’s not forget, a loss of 594,000 for Montreal and its surroundings (who lost those who left, the children they had and the created jobs). That would explain roughly a difference of 1,200,000 in population for Toronto and Montréal by mid-eighties because of separatism. Toronto forms the center of a collection of satellite cities and towns, in addition to its suburbs. Such a constellation of cities and towns is called a « conurbation ». Toronto’s conurbation curves around the western end of lake Ontario and has been named the golden Horseshoe. This small area of land now has 8,100,000 inhabitants. In this area about the size of Prince Edouard Island lives about one canadian out of five. One out of five. Montreal Urban Community now has 3,8000,000 inhabitants, about 4 millions less than toronto and its surroundings. The gap is much larger than the gap we expected 1,2 million because of separatism. So were there other forces at play? One might think that Toronto grew massively more because immigrants preferred Toronto to separatism plagued Montréal, and then still blame separatism. But obviously, immigrants also preferred Toronto to Moncton or Winnipeg. And Montréal draws more immigrants than these cities. And also, Toronto draws immigrants not only from others countries but also from everywhere in Canda, not only from Montréal. And as far as I know, Winnipeg is not plagged with separatism. So were there other forces at play? Human settlements and economies historically developped along lines of communication (oceans, open seas, rivers, roads, railroads, passes throught mountains and so on). Québec historical main line of communication is of course the Saint-Laurent river and the Saint-Laurent river valley development began two centuries before Ontario’s. Ships had to stop at Montréal and Montréal became the first important economic center. After the opening of the Lachine canal (1826), ships could reach the Great Lakes and Ontario’s development really began. With the building of railroads (1867 and later), the economic development of the West begins. With the development of both Ontario and western provinces, the nation economic center of gravity is slowly moving west. This development along lines of communication is one of the major geopolotical forces that drove the development of Toronto. All this occured well before the rise of separatism and would have occured without separatism. But when looking only at Canada, we miss the much broader north american picture. While Ontario and the western provinces were developping, another huge economic gravitational force was also developping. On the american side of the Great Lakes and across the Mississipi valley, millions were building roads, towns and cities. Again development took place along lines of communication, these lines were the east coast access to the Atlantic, the Mississipi, Missouri and Ohio rivers and the Érié canal reaching to lake Érié. In the eight american states bordering the Great Lakes now live 87 millions inhabitants, that’s ten times the Golden Horseshoe’s population and twice and a half the total canadian population. It is said that a picture is worthed a thousand words. 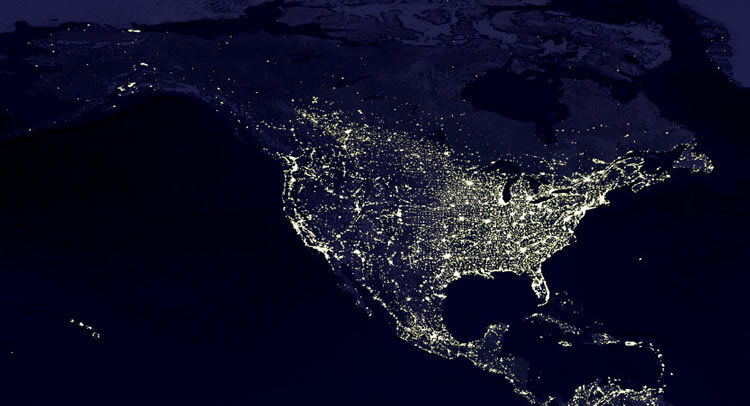 Have a look at this satellite picture of North America at night. Looking at this picture makes the economical gravitationnal force of the flat, fertile prairie of the great plains bording Missouri and Mississipi rivers obvious. Toronto benefits from the closeness of that huge neighboring economy. From Toronto, passing between lakes Ontario and Érié, one has access to the New York and Pennsilvanis states area ; passing between lakes Érié and Huron, one has access to Michigan, Illinois, Indiana and Ohio region. Passing between lakes Michigan and Superior, one is already a little too far west. Toronto is at the gateway to this huge economy at the south of our border. The american states bordering the Great Lakes are a regional market for Toronto and the closeness of these newly developing markets fueled Toronto’s development. Montreal is at the north east periphery of this huge north american economic mass. In the beginning of North America’s colonisation, Montreal was at the gateway to the inner lands and Montreal became Canada’s economic center. With the developement of the inner lands, on both canadian and american side, the economical center of gravity moved west and Toronto benefited from it. Today, Montréal’s turf is the Saint-Laurent valley; less and less english canadian, Montréal became Québec’s main economic center, it had found its niche, it became more and more québécoise. Geopolitical forces shaped the development of North America and decided of the faith of Toronto and Montréal. These geopolitical forces shaped the history of human development in all times and all places. Food for thought for those those who regret the good old times when the english ruled the land and blame separatism for the loss of their paradise. Rome did not decay because of the barbarian invasions, the barbarians invaded Rome because of Rome’s decay. How Toronto became the financial capital of Canada. The stock market crash of 1929. See the graph on page 28. According to this paper, the Toronto Stock Market exchange volume outgrew Montreal’s Stock Market by early 1930s. Interestingly, the PQ was elected long after the 1930s. About geopolitics, see Jean René Marcel Sauvé Géopolitique et Avenir du Québec, Éditons Guérin, 1994. It’s good for the brain. « Montreal used to be the chief metropolis, the national economic center of all of Canada. It is and older city than Toronto, and until only a few years ago, it was larger. At the beginning of this century Toronto was only two-thirds the size of Montreal, and Montreal was much the more important center of finance, publishing, wholesaling, retailing, manufacturing, entertainment -everything that goes into making a city economy. The first small and tentative shifts of finance from Montreal to Toronto began in the 1920s when Montreal banks, enamored of the blue-chip investments of the time, overlooked the financing of new mining opportunities which were then opening up in Ontario. That neglect created an opportunity for Toronto banks. The stock exchange which was set up in Toronto for trading mining shares merged with the old generalized Toronto stock exchange in 1934, and by the 1940s the volume of stocks traded in Toronto had come to exceed the volume traded in Montreal. During the great growth surge of Montreal, from 1941 to 1971, Toronto grew at a rate that was even faster. In the first of those decades, when Montreal was growing by about 20 per cent, Toronto was growing by a rate closer to 25 percent. In the next decade, when Montreal was adding a bit over 35 percent to its population, Toronto was adding about 45 percent. And from 1961 to 1971, while Montreal was growing by less than 20 percent, Toronto was growing by 30 percent. The result was that Toronto finally overtook Montreal in the late 1970s. But even these measurements do not fully suggest what was happening economically. As an economic unit or economic force, Toronto has really been larger than Montreal for many years. This is because Toronto forms the center of a collection of satellite cities and towns, in addition to its suburbs. Those satellites contain a great range of economic activities, from steel mills to art galleries. Like many of the world’s large metropolises, Toronto had been spilling out enterprises into its nearby region, causing many old and formerly small towns and little cities to grow because of the increase in jobs. In addition to that, many branch plants and other enterprises that needed a metropolitan market and a reservoir of metropolitan skills and other producers to draw upon have established themselves in Toronto’s orbit, but in places where costs are lower or space more easily available. The English call a constellation of cities and towns with this kind of integration a « conurbation », a term now widely adopted. Toronto’s conurbation, curving around the western end of Lake Ontario, has been nicknamed the Golden Horseshoe. Hamilton, which is the horseshoe, is larger than Calgary, a major metropolis of western Canada. Georgetown, north of Toronto, qualifies as only a small southern Ontario town, one of many in the conurbation. In New Brunswick it would be a major economic settlement. Montreal’s economic growth, on the other hand, was not enough to create a conurbation. It was contained withing the city and its suburbs. That is why it is deceptive to compare population sizes of the two cities and jump to the conclusion that not until the 1970s had they become more or less equal in economic terms. Toronto supplanted Montreal as Canada’s chief economic center considerably before that, probably before 1960. Whenever it happened, it was another of those things that most of us never realized had happened until much later. Because Toronto was growing more rapidly than Montreal in the 1940s, 1950s and 1960s, and because so many of its institutions and enterprises now served the entire country, Toronto drew people not only from many other countries but from across Canada as well. The first two weeks I lived in Toronto back in the late 1960s, it seemed to me that almost everyone I encountered was a migrant from Winnipeg or New Brunswick. Had Montreal remained Canada’s pre-eminent metropolis and national center, many of these Canadians would have been migrating to Montreal instead. In that case, not only would Montreal be even larger than it is today, but -and this is important- it would have remained an English Canadian metropolis. Instead it had become more and more distinctively Quebecois. Cette entrée a été publiée dans Uncategorized le 1 novembre 2011 par Michel Patrice. It had more to do with the PQ language laws than seperatisim itself. Before the 70’s, all non-Catholics could only get educated in English. The laws made it impossible to conduct business in English, so they had to move their business out of Quebec. The language laws are a thing of the 60s and later. Toronto outgrew Montréal long before. Not allowing non-catholics to french school was a mistake. Yes, it’s not the only reason, it is one of many. Jewish immigants to Montreal, for example, didn’t want to be English more than French. They really didn’t have a choice. So when the language laws started, their only hope of being employed was to move to Toronto. Even the monoligual anglos who stayed are no less employed than anyone else. That makes your fact a lie. No, it was not : it was what the anglo masters wanted. Sure Toronto was growing fast before the seppies came to power, however, I don’t share your point of view on the fact that Montreal would have fallen down on its knees to Toronto even if the separatists had never come into the spectrum of existence. the city was the main port in canada, which basically was/still is open year round as opposed to Toronto, which is 6 to 8 month a year, and for that matter, it would be even more logical for Montreal to be main gateway and metropolis of Canada…I can agree with you to a certain extent that the T.O was also a booming machine enough to even up with Montreal but as I mentioned, it’s all a matter of who holds the « main port » for the big boats! Now, as I read throughout your article, I noticed you denied the fact the separatists and their beloved fascist laws played a huge role in it’s downfall, but there are some evidences which indicate that it did in fact bring some severe consequences over its brightness… take sun-life for instance, they even admitted on the news that the reason which triggered them to leave MTL for TOR was due the language law and there is no way you could ever possibly deny that, it’s a fact and there are even more proofs that prove likewise in other case scenarios, michel! Remember when Bombardier threatened to leave the province, this was also due the language law which the Quebec government was attempting to impose right on their nose. Luckily, they decided to drop the entire case, otherwise Bomb would be Headquartered in TORONTO right now…One last thing I’d like to add before I wrap this up, do you seriously think it was just a mere coincidence that the City went drastically straight down the hill when the PQ came to power for the first time??? Seems to me that separatists like you refuse to acknowledge the pain you have inflicted over this province economically. the way I see it, I believe you don’t want to see and admit the ugly truth that hides behind those camouflaging arguments posted up there, which is intended to propagate lies and blind people to the truth…you’re just as bad as those conspiracy theorists who spew their NWO nonsense all over the internet ! According to anglos’s narrative, separatism is the first and only cause. My point is that separatism is not the only cause of the decline of Montreal, it is a cause among others. And the argument that our linguistic laws hurt our economy by driving anglophones and businesses out of Québec is a rational argument. Yet, francophones do not seem to care. Isn’t it strange? Why is that so? I see two tentative explanations. This type of hatred and bigotry towards whoever do not submit to anglo supremacy is another important reason for Montréal decline. Thanks for giving a clear example of that. Another important reason for Montréal decline is hatred and bigotry towards whoever do not submit to anglo supremacy. Blaming innocent persons unduly, comparing them to Nazis, etc. destroys the image of the city. And you, Septards, are you racist to the point that you can’t see the author of this article having been very humble and moderate in his point of view ? Can’t you see that your point of view is more extremist and less acknowledging of all cause of the socio-economic changes that happenned ? Who does the previous state benefit the most in Montreal ? Who for a full hundred year where banned to establish a francophone university in Quebec ? Who were not given the jobs by those who run English businesses in Quebec ? The language law, it is not a law against people who speak english, but a law to help those who speak french to have a way to use french to make a living… in the context of being in an environment surround by forces that want english to the only and main working language everywhere in Canada. Look at Ontario, Manitoba, N.B., where is now the futur for the french language in the workplace ? In museum in most of the communities that use to even have a majority of french speakers. You talk about racist, but very few francophone people in Quebec would dare to show so much racist as you did in your comment. Like little egoistic ill boy, accusing other of doing things that you do yourself tenthfold. But you probably don’t see it that way, yet. Hopefully other reader will not see through your comment the kind of extremist we get from people thinking like you which is a lot in lign with the propaganda you can often receive from some anglophone media, unfortunatly. Time to ban the use of monarchy slave symbols in Canada, starting with those on the dollars and those name like »royal navy » etc. Same for the sermon of loyalty to the monarchy, even though you might be happy with it. Every word a lie. The non french catholic individuals controlled family size, got an education, travelled outside this ghetto, invested their money and did not allow their minds to be distorted by myths of priests and evil men like Lionel Groulx. I could list a thousand people and hundreds of businesses who left their home and the reason was hatred discrimination and bill 101. 38 of them were my own flesh and blood, they are thriving, paying taxes and telling the world the truth about queebeck. Everyone I know has a plan to leave. Last one out turn out the lights.. I am glad that you got this off your chest. If every word is a lie, it will be easy to find counter arguments. My post is little long, simply pick one or two points and explain how I am wrong. Here like most everywhere else in the world and in history, the (Catholic) church was serving the (anglo) masters into keeping the people servile and quiet. Its no wonder why the first thing we did when we started to take control during the Révolution Tranquille was to get rid of religion and everything got better from that point. I am sorry for your misery but that is nothing but the masters suffering from being equal to their servants and I have no compassion for that. If you care about mistreatments done in is country then let’s talk about the deportations, massacres, starvations, infections, internments, concentration camps, language apartheid, segregation and forced exiles imposed by your nation to every one who were in Canada before them. OpenOffice.org, la suite bureautique libre.